it is no secret that there has been a lot of churn and turmoil in the fashion industry over the past five days. despite the incomprehensible nature of what John Galliano did and said, when the house of Dior announced today that he had been relieved of his duties at the head designer of the label, there was a lot of sadness and loss felt amongst the fashion community. Galliano has been at the helm of Dior for the past 15 years, for both ready-to-wear and haute couture, as well as the menswear line, and while he may be an eccentric, he brings life and vibrancy to the clothes he designs and brings the highest level of drama to the shows he puts on. the attention to detail and showmanship is something that the industry always loved and appreciated. it's what fashion is all about. Galliano may be a fool, but he is a master couturier. replacing him will be no easy task, and twitter was aflutter with speculation today. i saw people throwing around names like Haider Ackermann, Proenza Schouler, Christian Lacroix, Alexander Wang, Stefano Pilati, Riccardo Tisci, and Phoebe Philo and ....let's just get one thing straight here. Dior isn't just a pret-a-porter house...it is a COUTURE house, and the lifeline, the bloodline, of Dior is Haute Couture. whoever takes Galliano's place must not only be able to design for the ready-to-wear collections, they have to be able to bring it with the couture. insanely detailed, hand-made, dramatic, haute couture. -each season (twice a year), present a collection to the Paris press comprising of at least 35 runs/exits, with outfits for both daytime wear and evening wear. the French are not messing around here. they are serious about preserving the origins and heritage of Haute Couture, and you've got to be kidding me if you are seriously throwing Alex Wang out there as someone to take the reigns from John Galliano. i mean..get out. i love Alex Wang but he isn't a grand couturier, even by a long shot. i think the only two front runners are Christian Lacroix and Haider Ackermann. Lacroix has a history with his own fallen label in Haute Couture, and he's pretty weird, and i think the house of Dior could really refine him while giving him room to let his mind run wild. i think where Lacroix failed in his personal line was a lack of direction (it was just a whole lot of crazy), and with the rich history of Dior, he would have a set of runners to keep him in line. 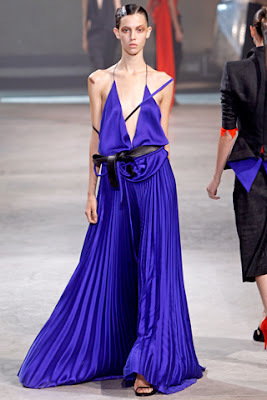 Haider Ackermann is kind of a dark horse, but not really. Karl Lagerfeld has already named him as the next big thing, and Lady Gaga just wore him on the cover of Vogue, but he's still an up-and-comer. his work is very avant-garde and he has a strong point of view, so Dior, again, could be a place for him to refine his influence and really stretch his very, very talented legs. Lacroix has more couture experience, but Ackermann is younger, fresher, and sexier...which is probably what Dior needs more than anything. 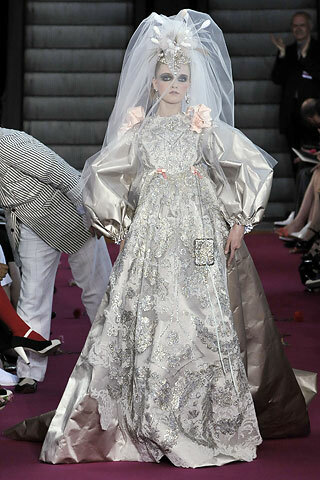 and i think Ackermann has the ability to be really, really amazing with not only the pret-a-porter collection, but the potential to blow us away with his trips into the land of Haute Couture. Galliano's final bow for Dior is on Sunday, and then only the fashion gods know where the reigns of the label will land. until then... i think i'm on Team Ackermann! award season 2011: the oscars! !